Louisburg claimed the top seed with last week’s 25-7 win at Paola. Madden Rutherford threw two touchdown passes, caught a touchdown pass, and rushed for another score for the Wildcats. Louisburg defeated Ottawa 25-0 just two weeks ago. Piper and Bonner Springs played last week with the Pirates blasting the Braves, 69-20. Because of that head-to-head victory, this is one of those situations where it looks strange to see Piper seeded lower than Bonner Springs. In last week’s game, Piper rushed for 462 yards led by Dalton White’s 202 yards and La’James White’s 231 yards. Both Dalton and La’James rushed for three touchdowns each. Dalton White, the Pirate QB, also passed for three scores. Pittsburg has been near the top five all season and has played well in posting seven wins against a difficult schedule. The Purple Dragons have been led by a consistent defense that features linebackers Dylan Jordan and Jerek Butcher. Pittsburg’s offense seemed to hit its stride last week in a 49-35 win over 5A No. 2 seed De Soto. Dylan White scored three touchdowns in the first quarter in the win over the Wildcats. Spring Hill isn’t your typical 13-seed. The Broncos’ four losses have come against opponents that are a combined 27-5 this season. That includes a four-point loss to Louisburg earlier this season. Spring Hill is led by running back Zade Barker. The Grizzlies and Stags will battle in a rematch of a state quarterfinal game last season. Bishop Miege won that contest 69-23, scoring all 69 points in the first half. While Labette County quarterback Easton Dean has played well, the Iowa State commit may not have enough fire-power around him to have enough success against the Miege defense. Basehor-Linwood has quietly produced another strong season under Rod Stallbaumer. The Bobcats lone loss came 14-13 to Lansing back in Week 2. Since then, Basehor has won six straight games by an average margin of 44 to 11. Senior Dylan Mussett has passed for 1,481 yards and 15 touchdowns, while Dylan Donnelly has emerged as the leading receiver with 608 yards and five scores. Marlon McDaniel has rushed for 584 yards and nine scores to pace the Bobcat ground game. Eudora almost pulled off the upset of Fort Scott last week. The Cardinals have struggled scoring having scored in double digits just two times this season. Fort Scott has been really good at times and struggled at other times this season. The Tigers almost pulled off an upset at Pittsburg in a 17-14 loss, but then were blanked by Paola (42-0) and needed overtime to top one-win Eudora last week. Quarterback Matt Campbell is a big, dual-threat player and has sparked a Tiger offense that is more two dimensional that in past seasons. Having Ty Gorman at receiver helps that element of the offense. Tiger linebacker Alec Michaud suffered a season-ending injury in the Bolivar (Mo.) game two weeks ago. Atchison enters this contest with a 4-4 record, but without a victory outside of the Kansas City-Atchison League. The Redmen are led by senior Sercy Duncan’s 571 rushing yards with eight touchdowns. Paola had dominated its competition until last week’s 25-7 home loss to rival Louisburg. The Panthers struggled offensively and turned the ball over four times. Paola allowed as many points in the loss to Louisburg, 25, as it had all season. The Panther defense has shut out five opponents, including Baldwin, 42-0, back in Week 5. Tonganoxie has been a pleasant surprise this season after losing key players to graduation off of last year’s 9-1 team. The Chieftains’ two losses this season have come to the top two seeds on the east side in Basehor-Linwood and Louisburg. Since those losses the first two weeks, Tongy has won six consecutive games. Korbin Riedel has rushed for 1,043 yards and 13 touchdowns to lead the Chieftain offense. Chanute has dropped three straight games since a 4-1 start. Ty Bowman has passed for nearly 1,200 yards and 12 touchdowns, while Corbett Kimberlin leads the Blue Comets with 412 receiving yards and five scores. McPherson and Louisburg are the only two undefeated teams in the 4A. The Bullpups have rolled over a relatively weak schedule and lead the classification with a 408-53 margin. Senior quarterback Kyler Hoppes has thrown for 1,665 yards with a 22/2 TD/INT ratio. McPherson is off to its best start since 1927. McPherson remains the 4A West favorite to reach the state title game – its first in school history. For the second straight week, Ulysses makes the 265-mile trip to Abilene. The Tigers have had a highly challenging season after the tragic passing of longtime coach Jason Kenny in the summer. Ulysses has posted a two-win improvement after a rare one-win season last fall. Ulysses also traveled 367 miles to Labette County two weeks ago and won 35-22. Last week, Ulysses lost, 26-21, to the Cowboys in a game that featured 12 total turnovers. Abilene is 3-1 after losing three straight and has also posted a two-win improvement from last fall. Mulvane has posted a strong year after longtime coach Dave Fennewald retired and standout quarterback Jayden Price went to North Dakota State. Mulvane went 6-4 last fall with an average score of 29-27 with Price injured for part of the year. This year, Mulvane has scored 31 points a contest and permitted 23 for new coach Daniel Myears. Tab Creekmore has thrown for 1,386 yards and 19 touchdowns, while Cole Diffenbaugh has 1,000 yards rushing and 11 scores. Drew Ellis, a Kpreps all-state wide receiver in 2017, has 626 yards and seven scores. Ark City is a dangerous team behind quarterback Cevin Clark. Sure the Bulldogs are 2-6, but those losses have come to quality opponents in Goddard, Maize South, Andover, and Andover Central among others. Don’t be surprised if Ark City gives Mulvane all they can handle in this game. Coffeyville completed the Class 4A bracket last Saturday with a 24-14 win over Christ Prep Academy. The Golden Tornado have posted four wins for the third consecutive season, but are making their first playoff appearance since 2014. Jaylen Logan leads the ‘Nado offense with 1,200 passing yards and 800 rush yards while combining for 22 touchdowns. El Dorado has dropped three consecutive games after each of the Wildcats’ wins this season. The wins have come against Independence and Circle, but competitive losses to Buhler, Winfield, and Augusta show El Dorado’s record may be somewhat misleading. Senior running back Braden Morgan (6-1, 210) leads the Wildcat backfield. Wellington defeated Rose Hill, 38-7, in late September this year. The Crusaders have enjoyed a nice turnaround with coach Zane Aguilar, an alum. Wellington has won four of the last five in the series. Wellington went 0-9 two years ago and 5-5 last season. The Crusaders were outscored last year with 15.7 points scored and 21.8 points allowed. This fall, Wellington has upped its average to 27.5 points a contest and 15.3 points allowed a contest. A win gives the Crusaders their most victories since an 8-3 season in 2008. Wellington has a strong group of offensive skill players with quarterback Michael Ledbetter, running back Grey Hatfield and wide receiver DeAndre Washington, one of the state’s top pass catchers. Ledbetter has thrown for 1,051 yards. Buhler, a traditional 4A power, opened the season with zero returning starters on either side. The Crusaders opened 2-3 but is 2-1 in its last three games. Last week, Buhler defeated Winfield, 28-21, at home with 365 yards on the ground. The teams meet up again in the same venue this week. Buhler has scored 199 point and permitted 193. Winfield has tallied 142 points and permitted 153. The Vikings may need a big game from quarterback KC Crandall to overtake the Crusader rushing attack. Goddard has been in the top-5 most of the season and has had a strong defense en route to the AVCTL Division II title. Last year, the Lions went 11-1 and scored 41.4 points a contest with 13.7 points allowed a game in Class 5A. Goddard shifted down a classification and has scored 23.9 points a game with 13.4 points allowed. The Lions are fifth in 4A in scoring defense. 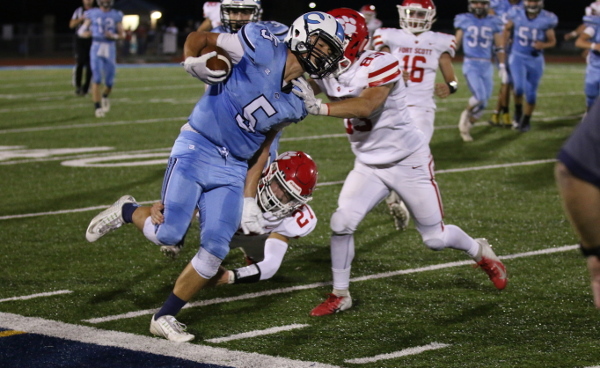 Goddard has split two overtime games with a 17-16 win versus Andover Central in Week 3, and a 23-22 two-overtime loss at Maize South two weeks ago. Circle’s two wins have come by a combined 16 points. In Week 4, the T-Birds beat Rose Hill, 20-10, at home. It ended a 19-game losing streak. Kam’ron Gonzales has 86 tackles for Goddard, while Kyler Semrad has passed for 1,279 yards. Andover Central defeated Augusta, 13-3, at home to open the season. Andover Central has won eight of the last 10 in the series. The Orioles have scored 115 points and allowed 234. Andover Central has tallied 134 and permitted 140. AC’s Jack Wiens has tallied 104 tackles, one of the state’s top marks.